First published in the American Singers Club newsletter, Spring-Summer 2014. Years ago when I was beginning to raise song canaries, I was watching my team of young German Rollers being judged. One of the birds was not singing, but instead spent his allotted time picking at his band. The judge noted this and declared the bird a nervous bird, and one that should be sold. "Get rid of it," he said, not knowing whose bird it was. Needless to say, he was indeed sold. My understanding was that a "band-picker" is nervous, and that the characteristic is inherited. Now, however, I have reconsidered this and think the real reason most birds pick at their bands is because the band is irritating the leg. There can be rough edges on the bands, especially if the bands are not cleanly cut during manufacture and are stuck together. If the edges are rough, I file them to smooth them over. When looking inside the band, there sometimes seem to be irregularities. 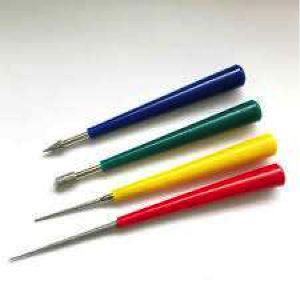 A friend in the fancy told me about the "bead reamer kit." There are four tools in this $5 kit, which can be found at hobby stores. I use these tools to smooth inside the band. I insert a reamer at each side of the band and twirl it around, applying pressure at the contact points inside the band, hopefully smoothing any rough spots. I then pull a piece of tissue through to remove any residue. Last year was the first year I tried this. None of the chicks showed the band-picker trait. This year is the second year, and again I will look for this during training to see if any show it. Hopefully, this problem is solved! The tools and process illustrated below. Copyright © 2014 Ninez Giles. All rights reserved.